Tissue engineering emerged in the early 1990s to address limitations of organ transplantation and synthetic tissue replacements, focusing on coupling cells and a biocompatible matrix known as a scaffold . Since then, some clinical success has been obtained for hard tissues, such as bones and cartilages , and for bidimensional soft tissue, such as skin and cornea , while the reconstruction of more complicated soft tissues is far more challenging. In particular, cardiovascular diseases are the main cause of death in the western world and there is an impelling need for new solutions to treat hearts damaged by myocardial infarction and to address the shortage of heart donors. Tissue engineering approaches are mainly based on the use of 3D biocompatible, bioerodable scaffolds and cardiac cells to reconstitute contractile cardiac muscle-like tissues in vitro that might be utilized for the replacement of diseased myocardium in vivo [4,5]. One order of problems consists in the identification of the proper source of cells. Recent advances in stem cell research now offer a promising cell source for the treatment of heart failure, due to their ability to self-renew and their potential to differentiate into the specialized cells . However, this is not sufficient for the success of the tissue reconstruction. A suitable interfacing between cells and scaffold is necessary for maintaining the activity of functional cells, regulating cell behavior, and reconstructing three-dimensional (3D) tissues. The scaffold must exhibit biocompatibility and biodegradability, porosity with adequate pore size to favor cell attachment and growth, as well as to facilitate the diffusion of nutrients to and waste products from the implant. Amongst the various materials employed for tissue engineering scaffolds, synthetic polymers such as polycaprolactone (PC), polyglicolide (PGA), polylactide (PLA), and their copolymers have drawn considerable attention due to their processability. The selection and design of the material is crucial to yield physical and geometrical characteristics at different length scales, necessary to reproduce the tissue complexity at the cell-scaffold interface. Figure 1 shows the features of a cardiac tissue at different length scales: (i) an optical micrograph of a heart tissue section showing that vascular ducts have size at the millimetre scale, (ii) a scanning electron (SEM) micrograph of cardiac stem cells showing that their size is of about 20 μm , and (iii) a scheme of the extracellular matrix (ECM) components at the nanometre scale. Figure 1: Different length scales of cardiac tissue to be integrated into the scaffold: mm scale for vascularization and nutrition, μm scale for cell accomodation, nm scale for the expression of ECM components. The scaffold should incorporate in a single construct the information that can trigger the reproduction of the cardiac tissue with all the different features. Therefore, approaches in scaffold design must be able to create hierarchical porosities in a single construct, at the millimetre scale to help nutrition and vascularization, at the micrometer scale to accommodate cells, and at the nanometre scale to favour the expression of extra-cellular matrix components, with the desired chemical and mechanical functions. The importance of producing three-dimensional structures with porosities at scales from the nanometre to millimetre level has been reported mainly for osteoblasts, to influence the interaction between cells ad scaffold in terms of mass-transport requirements for cell nutrition, migration and attachment . In some cases the emphasis has been put onto the nanoscale features needed by the scaffold, again in most of the cases for bone treatments and drug delivery . Although there are certainly similarities amongst the various cells, there are also specificities for the different tissues, and what is valid for bones should be critically evaluated, say, for heart. Several processing techniques have been developed over the past two decades to cast a large variety of materials into scaffolds suitable for the many different applications of tissue engineering and cell types (e.g. soft vs. hard tissues). Note worthily, none of them has emerged universally yet as the superior choice over the others, being all three currently active research topics. 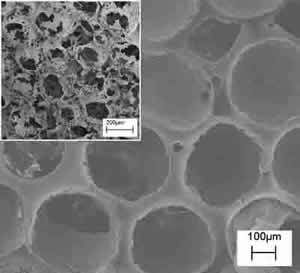 The strategy followed by researchers of NAST Centre is to develop several low-cost and user-friendly technologies that can be opportunely tuned to fabricate matrices with controlled architecture and morphological features, to match the requirements of hierarchical porosity and roughness that mimic the cell native surroundings. Some of these technologies, examined in here, are porogen leaching, phase separation and electrospinning . 1) Porogen leaching techniques involves the use of suitable porogens to be introduced into the polymer matrix and subsequently removed to generate porosity within the scaffold itself. The size and shape of the pores are entirely determined and tailored by those of the porogen chosen. For example, paraffin micro spheres of different size can be ad hoc synthesized and selected as porogen agents(Figure 2 – left). The resulting polymeric scaffold is shown by the SEM micrograph in Figure 2 (right), demonstrating spherical porosity in a close packed arrangement. The inset picture contains a cross section of the scaffold confirming a spherical open structure with communication paths between neighboring spherical holes. The opportune selection and preparation of the porogen as well as the balance of the polymer/porogen ratio allows manufacturing controlled scaffolds in terms of porosity and pore shape and size. 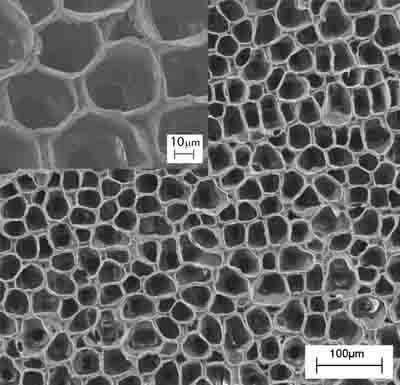 Figure 2: SEM micrographs of poly-L-Lactic acid, PLA, scaffolds prepared by paraffin leaching techniques. The paraffin spheres (left) leached out from a polymeric matrix leaving controlled open porosity (right) (the insert reports the cross-sectional view). 2) The phase separation technique is based on a thermodynamic demixing of a homogeneous polymer-solvent solution into a polymer-rich phase and a polymer-poor phase. In other words, the procedure discussed here consisted in a solid-liquid extraction of the solvent from a polymer-solvent frozen solution, the solvent acting as a porogen agent. It is possible to tune the architecture (in terms of morphology and porosity) of the scaffold obtained by this technique by tuning the temperature of the extraction process. Figures 3a and 3b show the comparison between the morphology of polymeric scaffolds obtained by the solid-liquid extraction performed in isothermal (T1=-18°C) and non-isothermal (-18°C<T2<25°C) conditions, respectively. Both samples have a regular, homogeneous, and highly porous surface, with pore size being different depending on the preparation conditions. The structures obtained at T1 (Figure 3a) showed a smaller pore size (about 20 μm in diameter) than the sample prepared in non-isothermal conditions (Figure 3b). The insets of Figure 3 show zoomed areas of the scaffold surface. In both cases, pores at the nanometre scale can be observed in the polymeric foam struts. It is evident from this example that it is possible to obtained multiscale architectures of polymer scaffold, with hierarchical porosity that matches the features of native tissue. Figure 3: SEM images of a poly-L-Lactic acid, PLA, scaffold prepared by the phase separation technique at two different temperature (T) of solvent extraction, (a) T=-18°C and (b) -18°C<T<25°C. 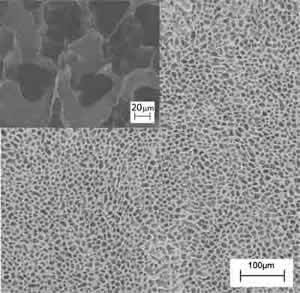 The insets show high magnification SEM micrographs of a PLA scaffold prepared by the phase separation technique at two different temperature (T) of solvent extraction, (a) T1=-18°C and (b) -18°C<T2<25°C. 3) Electrospinning is a polymer processing technique that has been revitalized with the advent of tissue engineering. The working principle of the technique consists of applying a high-voltage electric field (of the order of 1÷10 kV) between a metallic capillary containing a desired polymeric solution/melt and a collecting electrode (usually a conductive plate) electrically grounded. When the electrical field overcomes the resistance of the surface tension of the polymeric solution, the electrically charged solution is ejected from the capillary towards the counter electrode. The polymeric jet stretches under the action of the electrostatic force and produces long and thin fibers . In practice, the polymer solution is electrospun from a flat-ended needle of a syringe, whose shaft is actuated by a programmable syringe pump that supplies the solution to the needle and fuels the process. 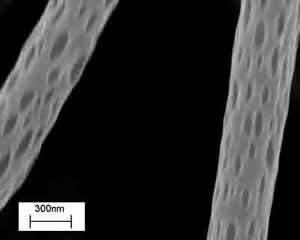 In most of the cases reported in the literature, electrospinning is used to prepare mats of fibers to be used as scaffolds for tissue engineering, with limited control in porosity and therefore in cell adhesion and growth. None the less electrospinning offers the possibility to tune most geometrical and morphological properties on the entire hierarchy of scales of the scaffolds. Thus, besides controlling the fibre diameter, it is possible for example to modify the macro porosity by changing the confluence, the number of layers, or the alignment of the fibres in the network. 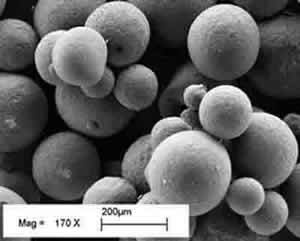 Micro and nanoporosity may also exist and be controlled. Figure 4 shows electrospun PLLA nanofibers (300÷400 nm in diameter) with characteristic nanopores, whose size can be controlled via process parameters (i.e., applied voltage, electrode distance and configuration, concentration and viscosity of the solution, solution flow rate, etc). Figure 4. 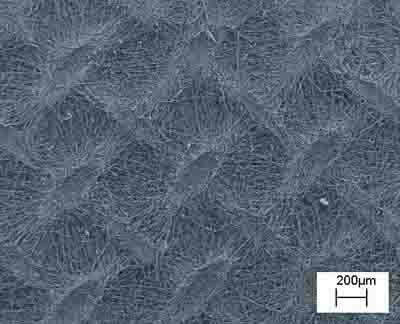 SEM image of poly-L-Lactic acid, PLA, electrospun nanofibers with nanopores. Electrospinning allows also the control of fibre alignment for the purpose of tuning the macro texturing of the scaffold. In general, if a simple collecting plate (e.g. an aluminium foil) is used, the electrospun fibres deposit randomly, forming a spaghetti-like stack. We devised patterned electrodes to control the achieve fibre alignment. Figure 5 (left) shows the experimental setup used, where two Cu parallel bars were first used as grounded collecting electrodes. Each bar was 50 mm long, with a square cross section 5 mm wide. They were placed 50 mm apart at a distance of about 170 mm from the syringe needle charged at about 20 kV. An auxiliary 180 mm diameter Cu ring was also connected to the generator to stabilize the electric field and control the jet motion. In this configuration, PCL fibers with a diameter of 2÷4 μm electrospan orderly between the Cu bars, rendering the highly oriented bundle (not shown). This result, relevant per se, served as a building block to device scaffold with more complicated patterns. Another experiment was performed with the same experimental set-up but the addition of another pair of Cu bar electrodes placed at 90° from the former, as shown in Figure 5 (bottom-left). The aim was the fabrication of a scaffold made with two groups of fibres oriented along orthogonal directions. Figure 5 (right) shows, indeed that the resulting scaffold exhibited a macroscopic texture with both a short-range ordered plot and periodic features orthogonal to each other. 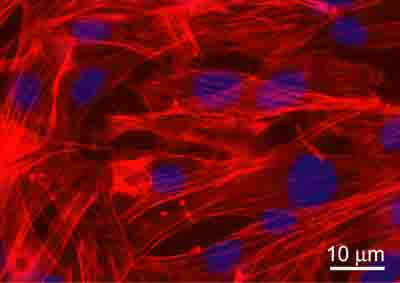 This approach offers a convenient technique to modulate the in-plane elasticity of the scaffold which has been found to be relevant for differentiation of cardiac progenitor cells . 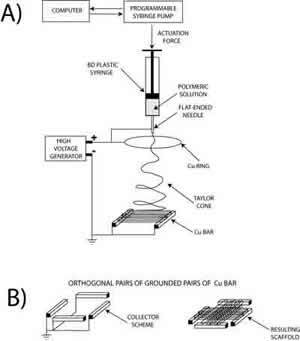 Figure 5: Schematics of the electrospinning experimental set up (left), where the grounded collecting electrodes were (a) two Cu parallel bars, (b) two pair of Cu bar electrodes placed orthogonal to each others. SEM micrograph of macroscopically textured PCL scaffold from 90° crossing of fiber bundles. The biological validation of the produced scaffolds was performed in vitro using a murine Lineage negative, Sca-1 positive, mesenchymal stem cell line of bone marrow origin (mMSC) . Cells were seeded on sterilized and equilibrated scaffolds at the concentration of 3X104/cm2. Cell viability and proliferation were tested after 24, 48, and 72 hours. Data showed no significant evidence of cell death with respect to cells grown on chamber slides in standard culture conditions (used as controls). To detect the proliferation ability, cycling cells were calculated as the ratio between the number of mitotic nuclei and total number of fixed and stained nuclei by fluorescence microscope analysis. Data showed that mitotic nuclei number of cells grown on scaffolds increased of 1.5 fold, after 24h and 3 folds, after 48h, similarly to controls. After 72h, no significant number of mitotic nuclei was observed, being cells grown at confluence. The validation was successful for all the scaffolds discussed inhere. For illustrative purpose, Figure 6 shows the immunofluorescence (IF) images of the mMSC seeded on scaffolds shown in Figures 3b. Stem cells were able to colonize the pores created and to adhere functionally to the scaffolds. Indeed adherent cells, decorated with tetra-rhodamine conjugated phalloydine, directed against F-actin, showed a typical elongated shape and well organized stress fibres. The results demonstrated not only the cytocompatibility of the materials used, but also significant adhesion and proliferation of seeded cells onto the constructs. Figure 6: Immunofluorescence analysis of F-actin expression (red) in mMSC grown after 72h, on PLA scaffold from Figure 3b. Nuclei were stained with 4’, 6’-diamidino-2-phenylindole (DAPI). Images of cell samples were taken with a Leica DMRB microscope using a digital camera. The images were representative of at least five random fields for each sample. The body of the experimental results demonstrated that 3D multiscale polymeric scaffolds for tissue engineering can be pursued with several approaches, each one having a characteristic signature. Porogen leaching (in a lesser extent), phase separation, and electrospinning techniques, all allowed the fabrication of porous scaffolds exhibiting features on different length scales, whose properties can be finely tuned by controlling the process parameters. Changing the size and shape of a target porogen, as well as modifying the temperature profile of a phase separation process, is a low-cost and user-friendly operation, enabling scaffold architecture in a broad range of length scales. Similarly, changing the materials (e.g., polymer, solvent, the composition of the solution) and/or the experimental setup (e.g., applied voltage, electrode distance, electrode pattering) can radically transform the appearance of the fibre network prepared using electrospinning. By means of purposely designed collecting electrodes, it is possible to switch from a totally random macrotexture to an ordered arrangement. Overall, the results demonstrate the applicability of tuneable polymeric scaffolds with hierarchical porosities in cardiac tissue engineering. Adult stem cells adhered and proliferated onto the fabricated constructs, providing the biological validation. R. Langer and J.P. Vacanti. Tissue engineering. Science, 260, 920 (1993). Y. Cao; J. P. Vacanti; K. T. Paige; J. Upton; C. A. Vacanti. Transplantation of chondrocytes utilising a polymer-cell construct to produce tissue engineered cartilage in the shape of a human ear. Plast Reconstruct Surg, 100, 297 (1997). K. Nishida, M. Yamato, Y. Hayashida, K. Watanabe, K. Yamamoto, E. Adachi, S. Nagai, A.Kikuchi, N. Maeda, H. Watanabe, T. Okano, and Y. Tano. Corneal Reconstruction with Tissue-Engineered Cell Sheets Composed of Autologous Oral Mucosal Epithelium. N. Eng J. Med. 351,12 (2004). W.H. Zimmermann, C. Fink, D. Kralisch, U. Remmers, J. Weil, T. Eschenhagen. Three-dimensional engineered heart tissue from neonatal rat cardiac myocytes. Biotechnol. Bioeng., 68, 106 (2000). Y. Miyahara, N. Nagaya, M. Kataoka, B. Yanagawa1, K. Tanaka, H. Hao, K. Ishino, H. Ishida, T. Shimizu, K. Kangawa, S. Sano, T. Okano, S. Kitamura and H. Mori. Monolayered mesenchymal stem cells repair scarred myocardium after myocardial infarction. Nature Medicine, 12, 459 (2006). N.N. Malouf, W.B. Coleman, J.W. Grisham, R.A. Lininger, V.J. Madden, M. Sproul, P.A. Anderson. Adult-derived stem cells from the liver become myocytes in the heart in vivo. Am. J. Pathol., 158, 1929 (2001). M.M. Stevens and J.H. George. Exploring and Engineering the Cell Surface Interface. Science, 310, 1135 (2005). E. Palin, H. Liu, and T.J. Webster. Mimicking the nanofeatures of bone increases bone-forming cell adhesion and proliferation. Nanotechnology, 16, 1828 (2005). L. Dan, X. Younan. Electrospinning of nanofibers: reinverting the wheel?. Adv. Mater., 16, 1151 (2004). G.Forte, F. Carotenuto, F. Pagliari, S. Pagliari, P. Cossa, R. Fiaccavento, A. Ahluwalia, G. Vozzi, B. Vinci, A. Serafino, A. Rinaldi, E. Traversa, L. Carosella, M. Minieri, P. Di Nardo. Polymeric scaffold guidance to stem cell differentiation and tissue warping. Nature Materials, (submitted September 2007).